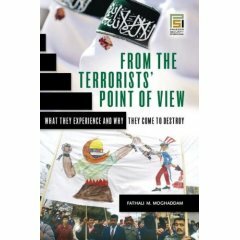 I just finished this pretty critical read: “From the Terrorists’ Point of View: What they experience and why they come to destroy” by Fathali M. Moghaddam. I was expecting a sympathetic view of terrorism to be presented based on the book title, but really the author offers understanding without sympathy. He talks about the “Staircase” or Five Floors that bring a person from dissatified (First Floor) to strapping a bomb around the waist and walking into a public space with the intent to kill (Fifth Floor). Knowing these steps helps to understand why and what and not just see “terrorist” as objects, but instead as people who are trying to bring about change…in the only way they see as feasible. I’ve discovered yet another reason to love Madison: The WI Book Festival. It’s similar to a film fest, but more…umm…academic. My weekend started on Friday night with presentations and then a panel discussion by Chimamanda Ngozi Adichie (Purple Hibiscus) and Zakes Mda (Ways of Dying). Matt Rothschild (of Progressive Magazine fame) talked about his book You Have No Rights and gave examples of ordinary Americans who have had basic rights denied to them in the name of national security. He shared the mic with Chris Finan who wrote From the Palmer Raids to the Patriot Act: A History of the Fight for Free Speech in America. My favorite parts of the weekend were the “Just Bust! Spoken Word & Hip-Hop Open Mic” on Friday and the “Talking Gods & Lyrical Legacies” on Saturday night. One act to check out more is the “First Wave Hip-Hop Theater Ensemble”. What an amazing group of kids!